Android and iOS get some Bing love ! 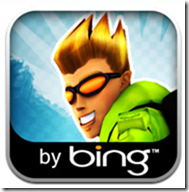 In the spirit of the holiday season, Bing has launched free mobile applications – Snowboard Hero and Powerboat Challenge for iOS device (iPhone, iPod Touch, and iPad) and Holidays 100 for Android devices. Interestingly, Windows Phone 7 users have no goodies in their stockings. With Snowboard Hero you are competing against an experienced snowboard pro, proving your skills on four steep runs. Negotiate breakneck speeds to be a master of the hill. Customize your powerboat and go full throttle on a twisted river course. Pass the buoys and fill up your boost bar and to unlock additional tuning options. With the prize money you win, you can upgrade your boat with bigger engines, chip tuning, fatter turbos, spoilers and more. With this application, top holiday songs like Mariah Carey’s “All I Want for Christmas is You” are streamed directly to your phone complete with album art. Available through January 2, 2011. Also, although all Windows Phone 7 come with Bing for Mobile application pre-installed, Bing App is also available in the App Store for iPhones as well as at all major U.S. mobile operators through Android Markets since a while. The application includes the Bing image of the day with clickable hotspots, image search, news, local business listings and reviews, instant answers for movies, flights movies, and access to Bing Maps, etc. Apart from that, if you want use Bing from a mobile browser on your high-end smartphone, m.bing.com can look and act like an app without you needing to download or launch one.